Graeme Shinnie’s Scotland experiences have set him up for a mammoth December in the red of Aberdeen. The Dons skipper made his competitive debut for the national side in the 3-2 win over Israel and comes back to Pittodrie with a Betfred Cup final and eight league contests to get stuck into. Shinnie was part of a strong Aberdeen contingent in the Scotland squad, with Scott McKenna starting and Gary Mackay-Steven an unused substitute. Former Dons Ryan Christie and Ryan Fraser both had starring roles while fellow midfielder Stuart Armstrong went to school in the Granite City. Attention now switches back to club business and it could prove to be a defining month for Shinnie and the Aberdeen squad. He said: “It’s a massive month in December, with nine games. It’ll be game, rest, game, rest. It’s always a telling time of the season and once we come through that, we’ll see where we are. We need to get back to working hard and pick up as many wins as we can. I’m desperate to get my hands on another trophy. It’ll be tough – Celtic are always good when they come to cup finals. We need to put our own stamp on the game, get stuck in and see what happens. 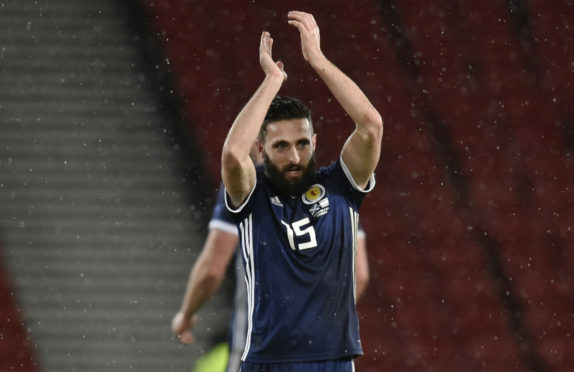 Shinnie won his fifth cap on Tuesday night when he was brought on at 3-2 for Christie, which was his first appearance in a competitive international. Given the outcome of the game and its importance to Scotland’s European Championship hopes, it will be an evening that lives long in the memory for the former Caley Thistle man. Shinnie said: “Waiting to come on at 3-1 and the goal goes in, changes the game completely. But the game was perfect for me, going on to a game like that. I was trying to get about and break up play when we were trying to hold on to a win. “It all happened so quickly. I knew going on at 3-1 it was going to be different than 3-2. That made it everything to play for and they threw everything at us. It was the perfect game for me to come on to as we had to fight and battle, which is what I’m all about. “It was a game I thoroughly enjoyed and winning made it extra special. We’ve had to show everything over the two games. The clean sheet and the performance against Albania was great and going 1-0 behind against Israel, it could have upset us. The boys showed character to get the goals we needed then showed we could dig deep and grind it out. (Allan) McGregor had a massive save at the end too and it’s massive team effort for the win. “I’m delighted to make my competitive debut. I’ve come on in friendlies and really enjoyed it, so it was always my aim to get a competitive debut and a proper cap. Every time I reach I goal, I reach for more and I enjoy being amongst the boys. I’ve made some great friends down here and it’s now about getting as many caps as I can.